← Easy peasy peanut butter cookies. 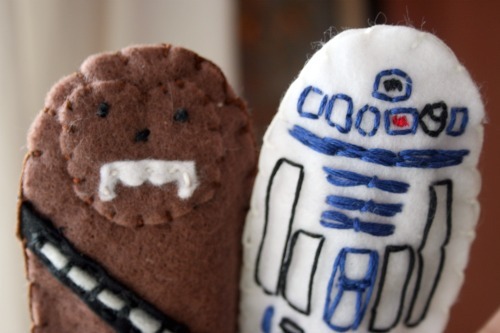 This entry was posted in fun finds, kid fun, scraps, sewing and tagged chewbaca, chewie, felt, finger puppets, r2d2, star wars. Bookmark the permalink. 4 Responses to Sometimes . . .
did you just do these? is there a pattern? they are so cute, and I know some boys (big and little!) who would love them! I just made it up. You had some hand in it! 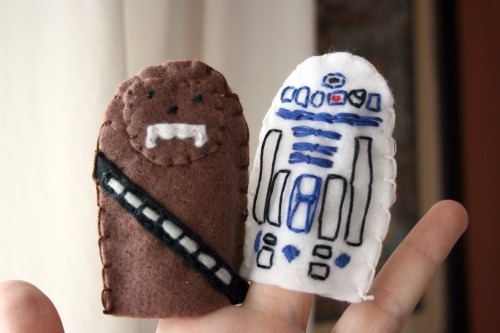 Seeing your Kermit finger puppet and then coming across someone’s Chewie plushie pattern gave me the idea. I soooo need to learn how to do graphics I could easily make a pattern if I knew that. Of course then I’d have to make Hans, and C3PO and . 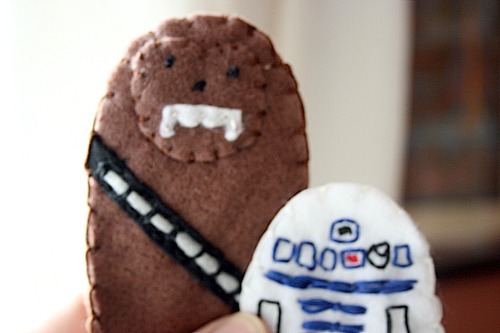 . .
You should share these with Peter Mayhew (the actor who played Chewbacca). He and his wife Angie (Love love love Angie) are always posting things people have made starring Chewie on their Facebook page.